This article is about Don Mueang district. For Don Mueang airport, see Don Mueang International Airport. Don Mueang (Thai: ดอนเมือง; IPA: [dɔ̄ːn.mɯ̄aŋ]; lit. "the upland where the town is located", for many years spelled "Don Muang") is one of the 50 districts (khet) of Bangkok, Thailand. It is bounded by (from north clockwise): Amphoe Mueang and Amphoe Lam Luk Ka of Pathum Thani Province; Sai Mai, Bang Khen and Lak Si of Bangkok; and Amphoe Pak Kret of Nonthaburi Province. Don Mueang was once part of Bang Khen, but it became a district in its own right in 1989. 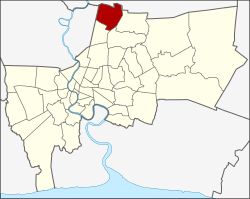 Later in 1997, the southern part of Don Mueang was split off to establish a new district, Lak Si. The old name for the area was "Don I Yiao" (ดอนอีเหยี่ยว) meaning plateau of eagles and vultures due to its geography and abundance of those birds. 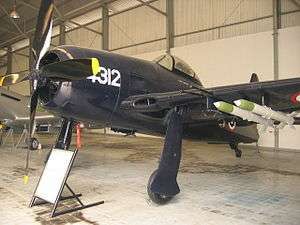 The new name was given by King Vajiravudh when the Royal Thai Air Force base was established there. Don Mueang has been a stronghold for the Pheu Thai Party (and its predecessors, Thai Rak Thai Party and People's Power Party), winning in every general and gubernatorial elections after the 2006 coup and is considered a "deep red" district. The last time the Democrats had an MP in the constituency was in 1976. However in the late-2012, Kanoknuch Naksuwanpha, a Democrat and a long-time local politician, won an upset election to secure her seat on the city council. It is believed that the reason she won was because of her long ties with Don Mueang as she built her political base in the area for decades. The economy is dominated by the presence of Don Mueang International Airport. Airports of Thailand has its head office in Don Mueang. Thai Lion Air also has its head office in the district. The head offices of R Airlines and Solar Air are on the property of Don Mueang Airport. Harrow International School, Bangkok is in the district. ↑ "Contact AOT". Airports of Thailand PLC. Retrieved 6 October 2016. ↑ "Contact us". Thai Lion Air. Retrieved 6 October 2016. ↑ "Headquarter." [sic] R Airlines. Retrieved on 27 January 2013. ↑ "About Solar Air". Solar Air. Retrieved 6 October 2016. ↑ "Contact Us." Harrow International School, Bangkok. Retrieved on 1 March 2013.